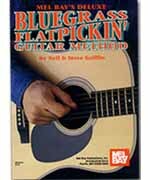 A comprehensive method for learning to play guitar in the bluegrass flatpicking style. The first part includes instruction on tuning, reading notation and tablature, learning chords from diagrams, bass runs, left and right hand techniques, plus short pieces and studies. The second part offers dozens of progressively arranged solos in standard notation and tablature with suggested accompaniment chord symbols.